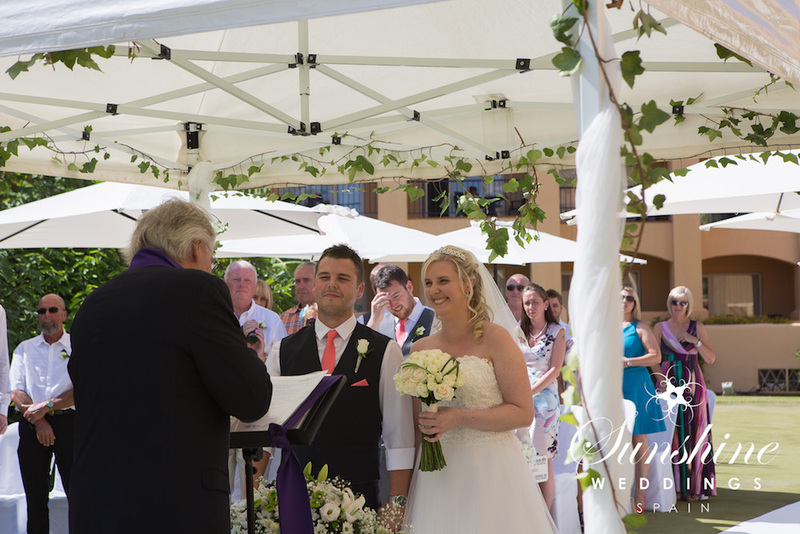 Vanessa and Adam chose to celebrate their Marbella beach wedding in mid-August. This can be a very hot time in the south of Spain, but because we manage dozens of weddings at this time of year we know how to make it comfortable and unforgettable for all involved. The couple’s chosen venue was a fabulous hotel and beach club in one of Spain’s most sought after locations. The ceremony was held outside and conducted by minister Jeff, accompanied by the romantic melodies of Mark on the Spanish guitar. As guests arrived they were shown through the hotel and to their sea-view seats by ushers Andrew and Ben and a very cute pageboy called Finlay. Because of the heat of the summer we ensured that all guests enjoyed a cool drink on arrival before the bride arrived. Choosing the perfect ceremonial music is key to any service, and we are always on hand to help couples choose the right music to suit their style of their wedding. Vanessa, wearing a stunning strapless wedding dress with full skirt, walked down the aisle to the tune of ‘Heartbeat’ by Jose Gonzalez. Adam looked smart with his coral tie in keeping with the bridesmaid’s gowns, and Vanessa chose white rose bouquets for her and her bridesmaids to set off their bright dresses. The ceremony had guests overlooking the sparkling Mediterranean sea and the couple also chose Adele’s ‘Make you feel my love’ song as part of their ceremony. 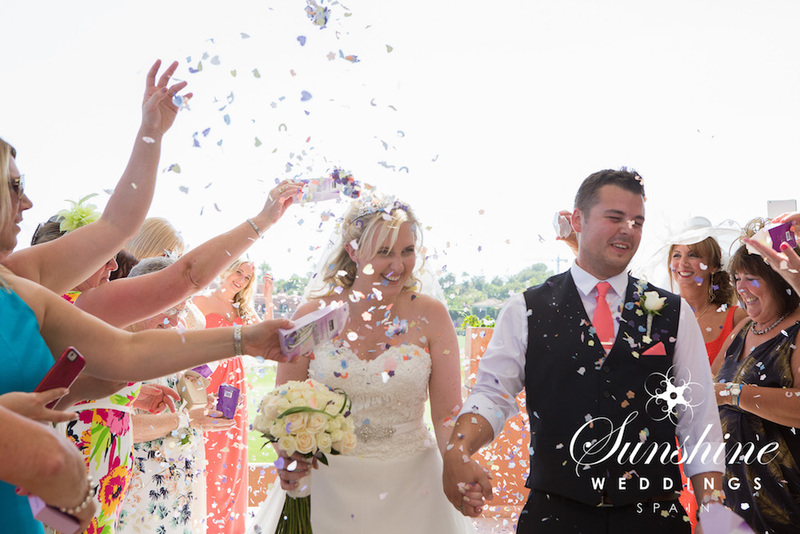 Guests enjoyed more drinks on the terrace as Vanessa and Adam completed their photo session with our much-loved photographer Gary Tapp, and as they returned were treated to a shower of confetti! Join us in Part Two to find out why this couple’s Marbella beach wedding was a gastronomic delight complete with a show that any wedding in Spain must have.